With his special gift from the gods he would ultimately transcend, Serling became the greatest writer in history. Rod Serling was a simple, mild-mannered television personality with a very special gift. He didn't know it yet, but soon events would unfold that would change the course of his life forever. Serling grew up in a small, quaint town, the kind that promises a good man every good thing. He spent his hours poring over his collection of books. Books which on the surface seem normal, inconsequential. But on this misty night somewhere on the eastern seaboard, he would find himself deeply mired in a story from which he could not escape, no matter how he tried. A simple pair of glasses, forgotten on a nightstand. For most men, a problem easily solved. But for Serling, it is the beginning of a nightmare that might never end. "Rodman? Rodman, are you still in there writing those stories of yours?" A single lamp illuminates a typed page as Rod Serling types carefully on a 50s-era typewriter. "Yes, Mrs. Goldman." "Rodman, I have to go. I made soup. You should eat." "Yes, thank you, Mrs. Goldman." "I'll see you in the morning then. I hope you're not still there when I come back!" "I'll be fine, Mrs. Goldman, thank you." Speculative fiction with a sci-fi and horror tendency will afford you a surreptitious outlet for your progressive voice, Rod. You can couch your social concerns about race, hatred and intolerance into fantasy elements, and eschew censorship. The typewriter continues to provide Serling with such sage advice, and he gains critical notoriety as well as popular success. Everything begins to look up for Serling. Soon, he becomes the greatest writer in human history. Whoever, or whatever, is behind the power in his typewriter has seen fit to bless him with a gift that transcends even its own divinity. Rod Serling is now Rod the God. But then, one night, Serling gets up to put more paper into the machine, but he leaves his glasses on the nightstand. 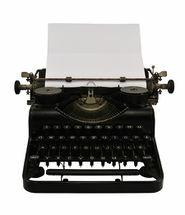 He stumbles forward and knocks the typewriter off of the desk. It falls to the floor and breaks. He begins to panic. Sweat beads on his brow as he tries in vain to put back together its several pieces. "No! No, tell me more! I must know what to do next! Don't do this now, I need more advice!" Without the typewriter's advice, Serling begins to falter, making poor career choices, selling the rights to The Twilight Zone, and relinquishing creative control over his television scripts. He becomes involved in a second-rate show, Night Gallery, and his credibility wanes. 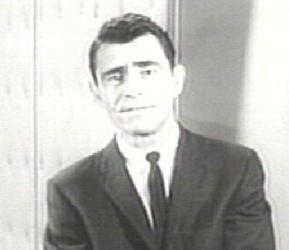 Within a few short years, several heart attacks and cigarettes by the truckload land Serling on his deathbed. 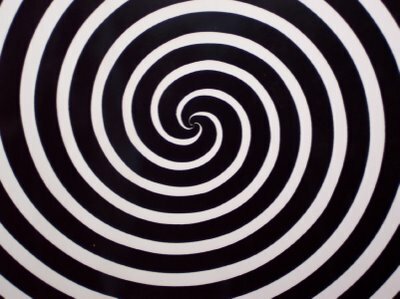 For those without comedic tastes, the "questionable parody" of this website called Wikipedia have an article about Rod Serling. A diagonal strip of light crosses the bed as Serling turns to his trusty housekeeper, who alone keeps vigil over his dying moments. "Mrs. Goldman. Hannah. There's a box under my bed. Get it out for me." Mrs. Goldman retrieves the old box and dusts it off. Carefully, she opens it. Inside sits the silent, broken typewriter. "What is it, Rodman?" "This typewriter betrayed me, Hannah. I owed all I ever became to this thing, until one night, an innocent mistake... Oh, Hannah!" He weeps bitterly. "I'm afraid I don't understand, Rodman." "After I go, will you take this thing out and destroy it?"